Priyanka Chopra and Nick Jonas' romance didn't take time to culminate into marriage. Just while we were reading their reports about enjoying frequent dates and baseball matches, we heard about his romantic proposal and the next thing we know was their planning for a big fat Indian wedding. Though we believe the couple was dating when they decided to arrive together at Met Gala 2017, Nick Jonas insists it wasn't the case. He reveals it wasn't a date of any sorts and just a casual appearance together. 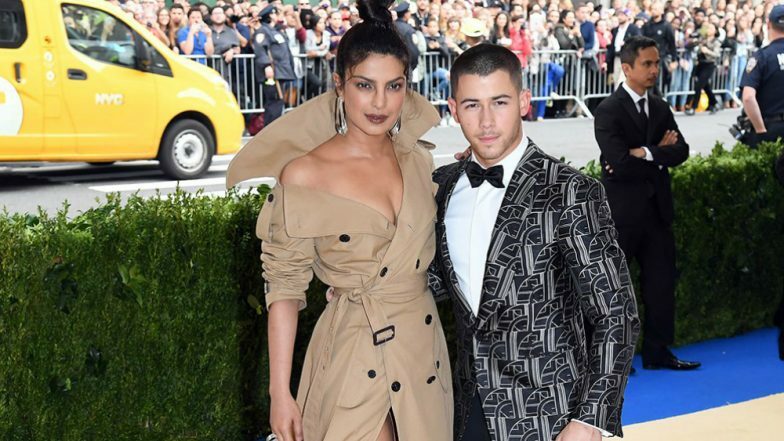 Priyanka Chopra on Hosting Met Gala Benefit 2019 with Nick Jonas: It’s an Honour. In his recent interaction with E! News, when Nick was asked about his Met appearance with PeeCee, he said, "That was one of our first dates...but it wasn't even really a date, I don't know how to describe it. "Interestingly, the couple is now a part of the Benefit Committee for this year’s Met Gala. Their romance has indeed come a full circle and they couldn't have been happier. Priyanka Chopra Jonas Gets Saved From Tumbling Down the Stairs, Courtesy Hubby Nick Jonas (Watch Video). Priyanka and Nick's future plans seem sorted and they do want some gorgeous babies. The Sucker singer revealed that every decision they take together is keeping the future and their child in mind and we think, it's damn adorable. From quashing all the divorce stories that surfaced recently to setting some relationship goals each day, Priyanka and Nick have come a long way and they still have miles to go together.